String pulling is a popular problem-solving task for investigating cognitive abilities in vertebrates, but has never been tested in insects. Now, a social insect has joined the club, according to a study publishing October 4, 2016 in the open-access journal PLOS Biology by Lars Chittka from Queen Mary University of London, UK, and colleagues. The researchers found that bumblebees can figure out how to pull a string to get a sugar water reward, that watching this helps other bees learn to do it too, and that this new skill continues to spread through a colony even after the original string-puller is gone. Understanding how behavior spreads in other animals could yield insights into the evolutionary roots of culture in humans. Social learning facilitates the transmission of behaviors from individual innovators to a group, and is common amongst animals from birds to rodents to primates. To test social learning in an insect, Chittka and colleagues attached strings to artificial flowers laden with sugar water, put these "flowers" under Plexiglas, and trained bumblebees to pull strings to access the sugar water. "What I like about the work," said Chittka, "in addition to the experimental and intellectual challenges and insights, is the sheer absurdity of seeing bees solving a string-pulling puzzle. When lead author Sylvain Alem first showed me a bee successfully pulling on the string, I just couldn't believe what I was seeing. And even now, looking at the videos still makes me laugh." The trained bees served as innovators. To see if other bees could learn from them, the researchers put 25 untrained bees in transparent cages where they could watch trained bees demonstrate their string-pulling prowess. Untrained bees rarely learned this skill on their own. But 60% of the untrained bees solved the problem after watching other bees do it, showing that these insects can learn socially. 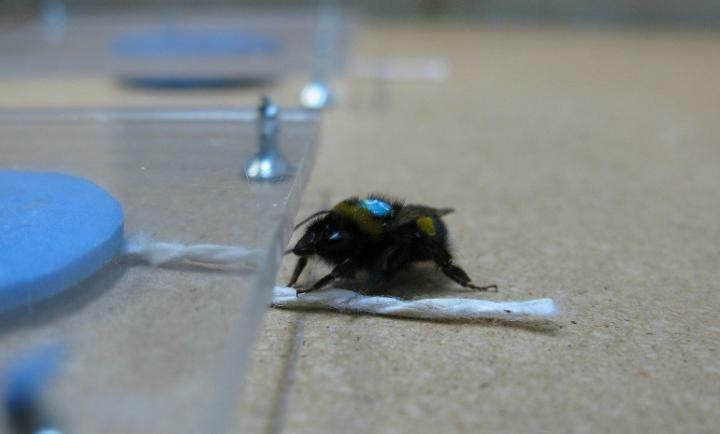 To test whether string pulling would also be transmitted culturally in bumblebees, the researchers added a single trained bee to each of three colonies of untrained bees. Then the researchers assessed string pulling in pairs of bees. After 150 of these bouts, roughly half of the untrained bees in each colony had learned to pull strings to get sugar water (53, 58 and 42 percent, respectively, for the three colonies). Moreover, even though the trained innovator died after only about a third of the test bouts in one colony, string pulling continued to spread, underscoring the strength of this cultural transmission. Chittka had initially been skeptical that the experiment would work, but his co-workers were up for the challenge "and found quite quickly that indeed bees could be trained to solve the string-pulling task. But it was even more of a surprise that not only could bees be trained to solve this task in a step-by-step manner – but a small minority of bees actually solved the task by themselves, without gradual training or observing a skilled bee. The final big surprise came in the context of social learning: we discovered that naïve individuals that would observe, from a distance, a skilled string-pulling bee, could subsequently solve the task by themselves." This work shows that social learning and cultural transmission can occur with a cognitive toolkit far simpler than that of humans. In fact, suggest the researchers, the sophisticated forms of learning and cognition specific to human culture–in all its complexity and diversity–may have evolved from humbler forms like those of bumblebees. "How much brainpower is actually required for any one task – how many neurons, how many sequential and parallel neural processing stages?" wondered Chittka. "In that view, the single task that actually requires a big brain has not been discovered yet, and indeed there is more and more evidence, both from experiments on small-brained insects and computational neuroscience, that small circuits can deal with exceptionally complex challenges." Funding: SA was funded by the Fyssen Foundation. CJP was funded by a Marie Curie Postdoctoral Fellowship. XZ was funded by the Staff Development Programme of the Xishuangbanna Tropical Botanical Garden (XTBG), Chinese Academy of Sciences. OJL was funded by the Jenny and Antti Wihuri Foundation. LC was funded by an ERC Advanced Grant and a Royal Society Wolfson Research Merit Award. The funders had no role in study design, data collection and analysis, decision to publish, or preparation of the manuscript.